AtlasIED designed the DPA Series to be your "everyday use" amplifier. 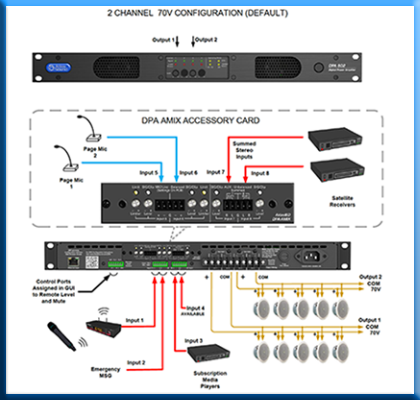 You can stock in your inventory and it can be dynamically configured in three different amplification arrangements to meet the design requirements of any installation. 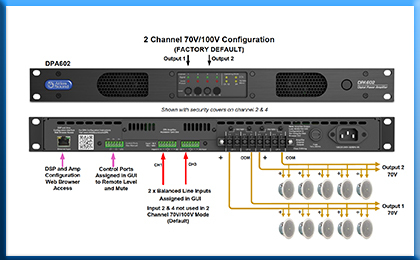 The unit is factory preconfigured in a two-channel 70V / 100V mode. If the design requires four channels of low impedance amplification, the amplifier can be configured as 4-channel model with either 4Ω or 8Ω load impedances. Many system designs require both low and high impedance amplification. 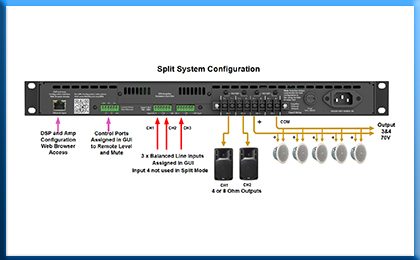 This unit can be configured to deliver 70V / 100V for a paging / background system on a single channel plus two additional 4/8-Ohm amplifier channels for a foreground stereo application. 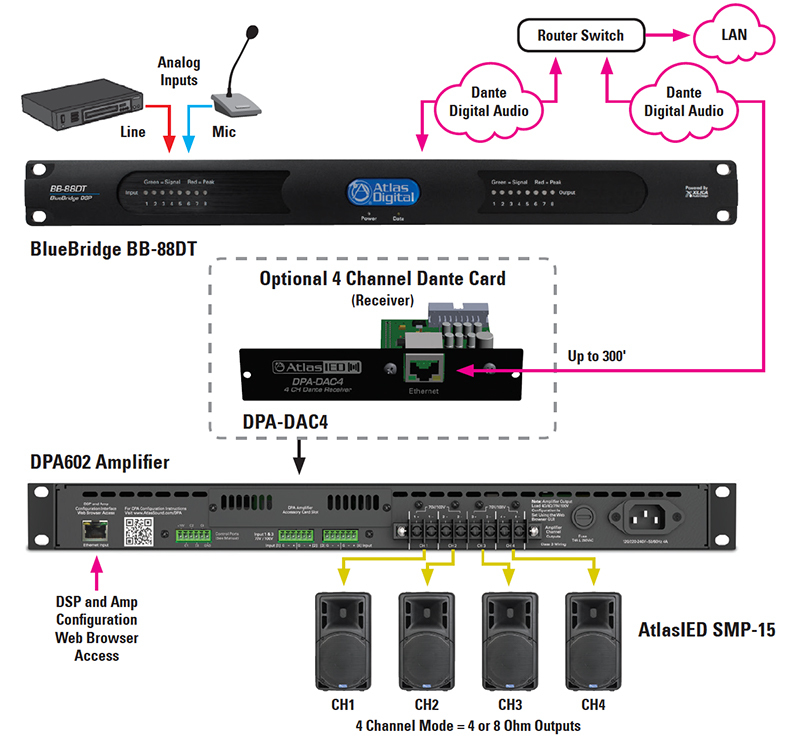 Each DPA Series amplifier provides network setup and control making it an affordable “game changer” in the commercial audio amplification world. You can connect the DPA Series to your local area network (LAN) and control it remotely. Access to the GUI (Graphical User Interface) is accomplished via any computer, tablet or mobile device using a web browser. It does not require a dedicated software application to program and operate the amplifier. Our GUI is embedded into the amplifier. A comprehensive set of "easy to program" digital signal processing is provided. You can mix and route the four provided input channels or expand to eight input channels via the expansion cards. Each channel has an assortment of DSP tools including level controls, EQ’s, limiters, high & low pass filters, and delay to provide flexibility for a range of applications. Using AtlasIED's Site Manager Software, you can view all DPA amplifiers within your entire system. The software provides system fault reporting and signal status. Another feature is the ability to easily update all of your DPA amplifiers from one GUI. 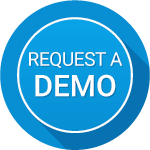 AtlasIED Site Manager Software also provide automatic 'on' and 'standby' activation via a time scheduler. Now, your amps can automatically go into sleep mode and wake up when needed during your business hours. The DPA Series has an expansion slot allowing the capability to expand functionality. 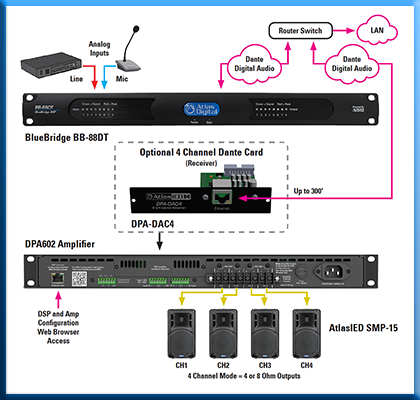 Our optional DPA-DAC4 card adds Dante™ network digital audio capability. 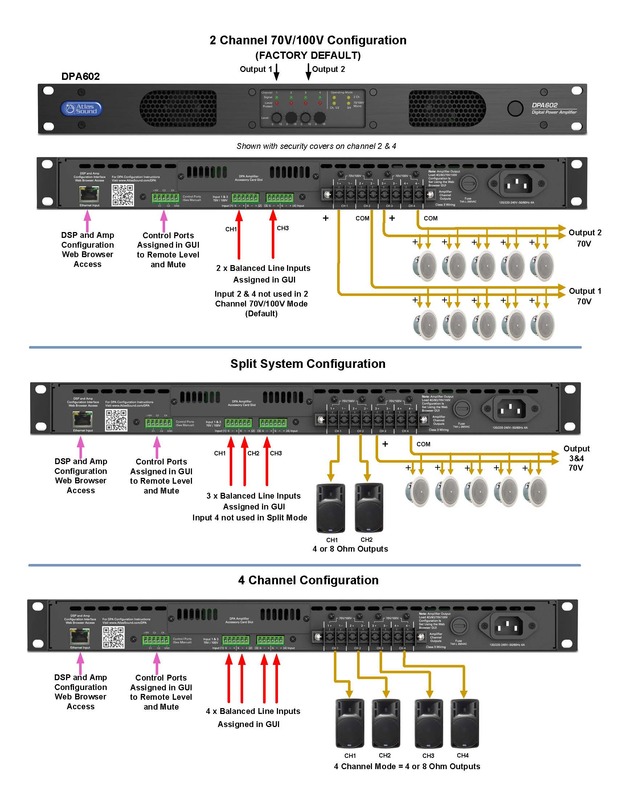 You can receive up to 4 digital channels, and each can be mixed, processed and routed to any amplifier's output channels. Using the expansion slot, you can add the DPA-AMIX card. 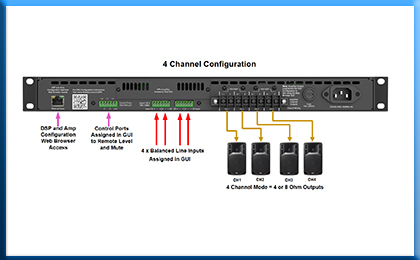 This provides four more analog input channels expanding to eight total input channels. 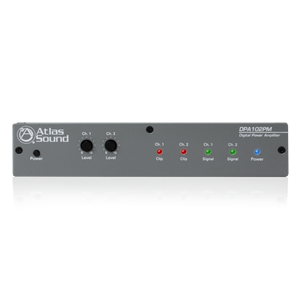 Each input channel can be mixed, processed, and routed to any amplifier's output channels. 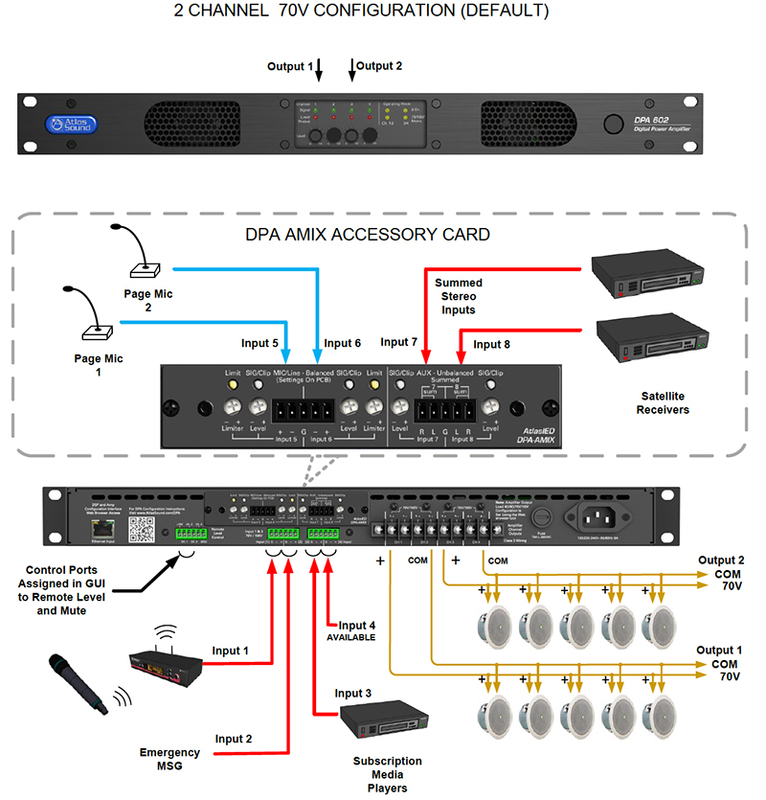 Each DPA Series amplifier has tactical gain controls and status LED's. The front gain controls can be deactivated via the built-in DSP. 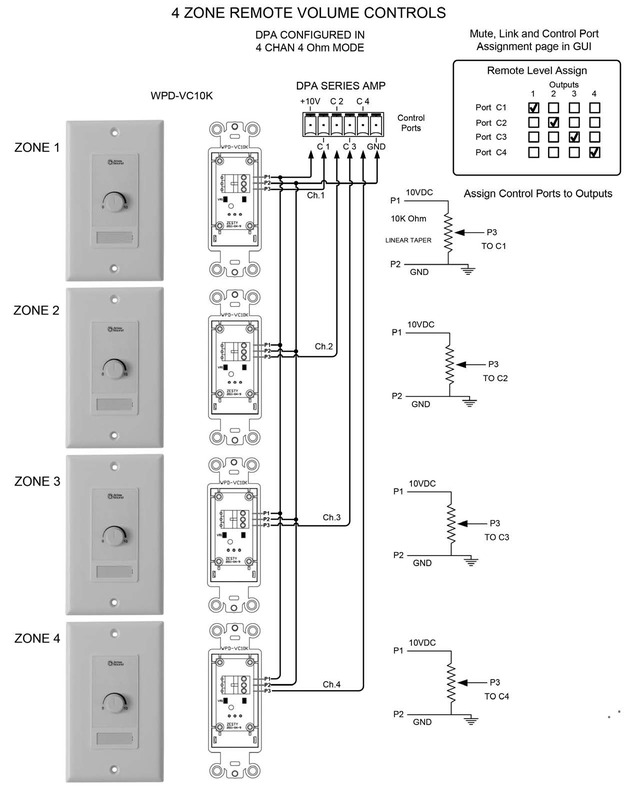 This provides tamper-proof protection and ensures your system gain staging stays optimized. 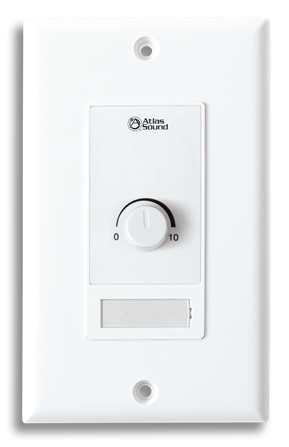 Using our optional WPD-VC10K, you can add up to 4 units and provide wall-mounted level control for each amplifier zone. The unit is constructed of durable ABS material and a removable label guard for easy and clean zone designation. The unit uses a 2 or 3 conductor cable. This unit can function in up to 200 feet from the DPA Series amp using 22-gauge wire.